The Defence Research & Development Organization (DRDO) has showcased its Muntra (short for “Mission Unmanned Tracked”) unmanned ground vehicle (UGV) for detecting mines and operations in nuclear, biological and chemical (NBC) conditions. According to The Economic Times, DRDO’s Combat Vehicles Research and Development Establishment (CVRDE) had developed the Muntra for the Indian Army, but the system has also drawn interest from the country’s paramilitary outfits for counterinsurgency (COIN) use against Naxalite militants. DRDO is pitching three Muntra variants: the Muntra-S for surveillance operations, the Muntra-M for mine-detection and the Muntra-N for areas ridden with NBC threats. 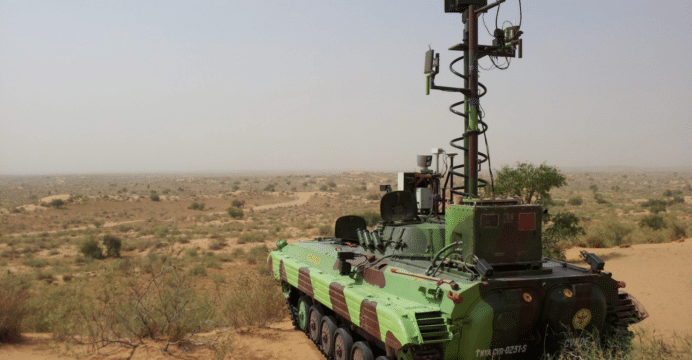 The Muntra’s tests were completed in the Mahajan field firing-range in Rajasthan, where DRDO was able to validate the UGV’s viability in hot-temperature (52°C) environments. It is equipped with a surveillance radar and electro-optical (EO) sensor with integrated laser rangefinder. The general objective of UGVs is to deploy vehicles in conditions that are excessively risky and/or outright inaccessible for on-site human input, such as NBC environments, diffusing bombs and entering ambushes. However, UGVs may be of interest beyond military applications, especially in high-risk civil security and civil services duties, such as law-enforcement and firefighting. In 2014, the Director of CVRDE Dr. P Sivakumar told Indian news outlets (such as The New Indian Express) that the Muntra’s radar has an instrumented range of 18 km. DRDO/CVRDE had tested the Muntra from a distance of 5 km and had the UGV travel up to an additional 12 km. At the time, Dr. Sivakumar had cautioned that DRDO was in talks with the Indian Army to define the latter’s UGV requirements, the formation of which will inform the development of a serviceable platform. In 2010, the Indian Army did induct BMP-2-based NBC vehicles. If the Army were to adopt the Muntra, it has the option of recycling its existing fleet by retrofitting some vehicles into UGVs. However, a new clean-sheet platform is an alternative. Many foreign UGVs have manifested in original platforms that are generally smaller and lighter (to varying degrees) than the Muntra. DRDO can also explore using its robotics work to UGV applications for mine/improved explosive device/bomb-detection and disposal; intelligence, surveillance and reconnaissance; and remote weapon system usage. Something lighter than the Muntra but larger than the DRDO Rudra and Daksh could be the long-term objective. DRDO may get the opportunity to examine the Muntra’s viability – and that of the UGV concept as a whole – should the vehicle see adoption by the Indian Army and Central Reserve Police Force (CRPF), with the latter potentially using the UGV for COIN against Naxalite insurgents.